He is not, of course, going to bring back coal mining as an occupation. Coal employment’s plunge began decades ago, driven mainly by the switch to strip mining and mountaintop removal. A partial revival after the oil crises of the 70s was followed by a renewed downturn (under Reagan! ), with fracking and cheap gas mainly delivering the final blow. Giving coal companies new freedom to pollute streams and utilities freedom to destroy the planet won’t make any noticeable dent in the trend. Even in the heart of coal country, the industry hasn’t really been a major source of employment for a very long time. 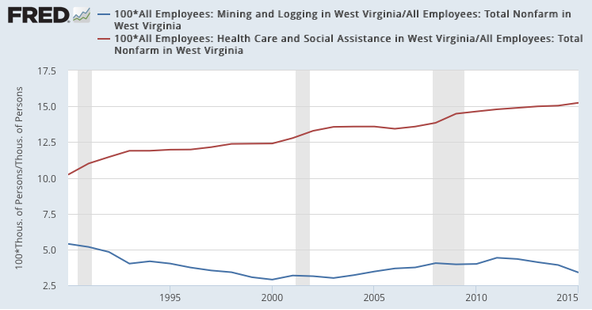 Even in West Virginia, the typical worker is basically a nurse, not a miner — and that has been true for decades. So why did that state overwhelmingly support a candidate who won’t bring back any significant number of mining jobs, but quite possibly will destroy healthcare for many — which means jobs lost as well as lives destroyed? The answer, I’d guess, is that coal isn’t really about coal — it’s a symbol of a social order that is no more; both good things (community) and bad (overt racism). Trump is selling the fantasy that this old order can be restored, with seemingly substantive promises about specific jobs mostly just packaging. One thought that follows is that Trump may not be as badly hurt by the failure of his promises as one might expect: he can’t deliver coal jobs, but he can deliver punishment to various kinds of others. I guess we’ll see.